Virginia Heffernan reveals the logic and aesthetics behind the Internet. This could be a somber exercise, examining the ashes of Pompeii rather than glimpsing the City on the Edge of Tomorrow. But Heffernan is a gleeful trickster, a semiotics fan with an unabashed sweet tooth for pop culture, who believes we shouldn’t confuse grief over the passing of our favorite technology with resentment because some digital alchemy failed to preserve analog experiences ... Loss means plenty to mourn — at one point Heffernan trips into a memory hole for the cord-tangling days of gabbing on the house phone. That nostalgia feels outmoded in places ... That’s what makes Magic and Loss hold together: It embraces the internet as a work in progress. It’s an enjoyable snapshot, perhaps imperfect, but always dangerously close to receding from view as we scroll onto whatever’s next. Plenty has been written in both these veins. The internet is a gee-whiz wonder that will change everything (that’s the magic part) or a force destroying and dumbing down culture (the loss). Ms. Heffernan tries to avoid both extremes, mostly by choosing off-beat examples ... The author is at her best pointing out the natural but silly inclination of elites to denigrate much internet fare ... Sometimes all these explorations can be a bit much ... Nonetheless, Magic and Loss is an illuminating guide to the internet. ...some of the most engaging parts of the book are the broadly autobiographical sections in which she reconciles the apparent contradictions of her own dual identity as both an early adopter of networked technology and a literary academic ... her book is at its most satisfying when it’s letting the air out of inflated rhetoric about the death of this or that cultural form ... Heffernan’s enthusiasm for the whole digital panoply is often infectious, but the experience can at times seem less like reading criticism than browsing an exceptionally well-written series of product reviews. In this sense, the book never really gets close to fulfilling its stated aim of understanding the internet 'as an integral part of our humanity, as the latest and most powerful extension and expression of the project of being human.' What Heffernan does come to an understanding of, and writes wonderfully about, is the internet as an integral part of her own humanity. 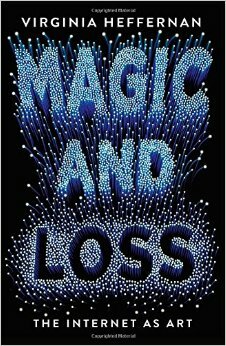 What did you think of Magic and Loss: The Internet as Art?